Children presented colourful cultural programmes during Ganeshotsav and Leprosy Eradication week at the organisation. At the Sports day held on 31 January all the children participated. Children also participated in a Drawing Competition wherein the winners were given medals and certificates. Republic day was celebrated with great fervour and the children’s parade and the cultural programme were the major attractions. This year six children of the organisation appeared for the 10th Board examination. Two girl students are pursuing Nursing Assistant course. One of these girl students is also studying B.A. through distance learning. At the organisation’s Hostels, teachers regularly teach children variety of subjects. even furnish adequate details. His daughter was very helpful in giving information. Pooja’s condition was also not good and she was weak since from many days she was going from one place to another with her father. For two to three days Pooja also stayed with her father in the hospital only. Since Pooja only spoke and understood Hindi language the environment was much unknown for her. From fourth day, Pooja was admitted in the hostel. She felt like she had come to some new world. She cried a lot and on getting a chance would run away towards the hospital from the hostel. The staff would cajole her and bring her back. Gradually in a few days, Pooja started mingling with other girls in the hostel. All the other girls, whether older to her or younger to her, made Pooja their friend. 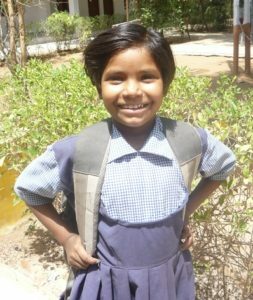 Pooja began going to school with other girls. She also began attending tutions in the morning and evening. She also began learning Gujarati. Now Pooja plays and eats with other girls and doesn’t seem like a new entrant anymore. Her father is still under treatment. He has decided to stay at the organisation henceforth even after his treatment is over to give his daughter a bright future. Due to the damage in both hands, Pooja’s father had faced big loss. That is improving now due to treatment. Pooja goes once every day and meets her father at the hospital but now her home is the hostel. Trupti came to Shram Mandir in the year 2003. Having been associated with the organisation from childhood, she settled down well with everybody. She did her primary education in the Shram Mandir primary school. She did her high school from Vadodara. 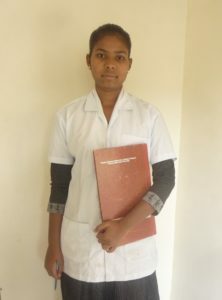 Post schooling, along with graduation she also began doing a course for Nursing Assistant. She is preparing for final exam of that course. During the course tenure she also did a six month internship in a well known hospital of Vadodara. Trupti was interested in music and dance from childhood and enthusiastically participates in all programmes of the organisation. She still has a year to study. Then she will work as a nurse. Of her 19 years, Trupti has been with the organisation for 13 years. Now she is ready to return to her home. She has good education and also nursing degree. She will be proud and financially self dependent which has been her dream.